Our mission: We do more with less to be socially, environmentally and holistically sustainable. By working with local partners such as Clean Ocean Action, Surfrider and Waves For Water, we engage our staff, customers and our community. Thru our new launch of a community sustainability app - we will provide community points for those engaged in environmental and community action. 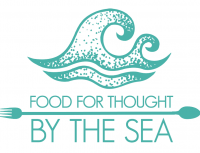 Thru our non profit Food For Thought By The Sea we engage our staff and customers in our efforts. Marilyn Schlossbach has been a staunch prponent of environmental and community causes. Thru various restaurants and partnership, she has been able to engage the community. Through Food For Thought we have created a board of passionate people who can follow her lead. Engaging the staff in beach sweeps, sustainable water projects globally and our no straw policy. We have adopted a "NO Straw Policy". All products including paper, aluminum, glass, cardboard are recycled. We use paper bags and aluminum to go containers so that they can be recycled. Over half of our garbage is recyclable. We do not allow customers to bring balloons into our establishments. Balloons are one of the largest culprits of environmental coastal waste. We embody local and sustainable buying practices. We work closely with Merrick Farm and the Kula Urban Farm as well as the Tri County Co-op to make sure we are supporting our local farming and organic community. We only serve sustainable seafood in our locations. We are constantly looking for new ways to practice the three pillars of sustainability in both our purchasing and our company practices. Our primary mission is to work with our staff and customer base to engage them in community efforts that come from their particular passions. Some of our partners are Interfaith Neighbors, The Boys and Girls Club, Fullfill NJ, The Center, Waves For Water, Surfrider, Clean Ocean Action. We do three holiday free dinner for our community as a partnership with Feeding Friendz.